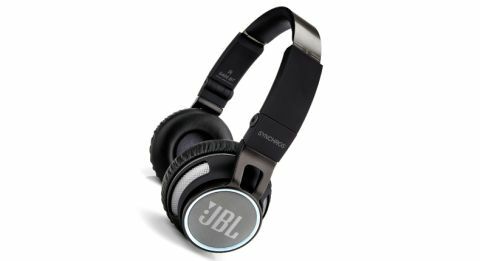 JBL Synchros S400BT review | What Hi-Fi? And this is the first area where the JBL Synchros S400BTs fail to deliver. The earpads and headband are soft enough, but we found our ears warming up after just a handful of tracks. The headphones also feel quite loose sat on your ears and this, combined with their weighty build, means they can wobble and slip off your ears a bit too easily. And, where the Jabra Revo Wireless integrates touch-sensitive controls with some degree of success, the JBL S400BTs don’t execute this feature quite as well. The insert of the left earcup is one large touch-sensitive control panel. Want to skip a track? Slide your finger forwards or backwards. Change volume? Slide your finger up or down. One quick swipe changes it one step at a time, while sliding and holding your finger down on the outer edge sees the volume rise and fall in increments. Tap the surface to play, pause or answer phone calls with the built-in mic. Each command is met with a bright, white neon glow from the LED ring, which runs around the insert. Unfortunately, the controls aren’t always responsive and sometimes it takes a couple of attempts for them to do your bidding: you tap the panel and end up pausing music, when you actually want to just skip a track. Buttons for power and Bluetooth blend into the surface on the left earcup and there’s also a 2.5mm jack for the supplied headphone cable, just in case you go over the 15-hour battery life. There’s no in-line mic or control on the cable though, which is a bit of a shame. If you own a compatible smartphone, you can tap it on the right earcup and use the built in NFC chip to shave a few seconds off the pairing process. The JBLs are a sturdy design and there’s quite a bit of heft to them. They’re hinged and also rotate through 180 degrees, so you can pack them away without taking up too much space. Bassheads will undoubtedly get a kick from their solid, exciting presentation. Stream Kanye West’s Black Skinhead and the opening exchanges of bass sound especially bombastic. There’s a real sense of power and weight as the JBLs take the track’s enthusiasm and run with it. Problems arise when music calls for greater control and finesse. Emeli Sandé’s Maybe requires delicacy and a subtler, tender tone. Instead the drum kick running in the background simply overpowers and overwhelms the rest of the track. You don’t really get a chance to enjoy her vocal as the headphones fail to pick out subtle details from the percussion and strings. The JBL’s aren’t bad headphones, but the bass needs taming and those operational and design issues need ironing out too. A bit hit-and-miss, then.